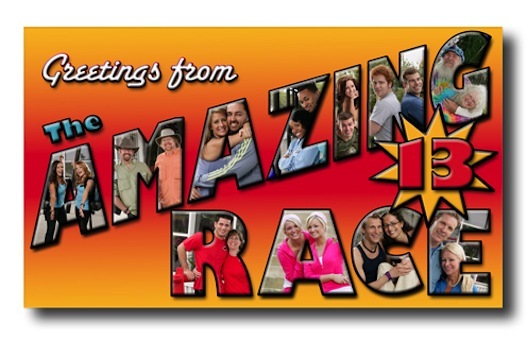 Fort Worth native and former Dallas Cowboys cheerleader Emily Starr Spangler and her New York-based actor husband, Nick Spangler, are among 11 teams competing in CBS' 13th edition of The Amazing Race. "Both are extremely driven and competitive, especially with one another," the network says in a news release. "They admit to being over-zealous when a prize is involved." Well, that's always helpful. The new field also includes Houston sales representative Kelly Crabb and her pal, Christy Cook of Austin, who's now in "business development." Both are 26-year-old divorcees, says CBS. The five-time Emmy winner as best reality series returns on Sunday, Sept. 28th, with the Los Angeles Memorial Coliseum as its starting point. ***This is never a good idea. The CW, which fell further behind Univision last season after a sharp ratings downturn, is withholding its new 90210 series from the prying eyes of TV critics. In a "Statement Regarding 90210 Screener," the network said that it and CBS Paramount Network Television have made a "strategic marketing decision" to keep the show from being reviewed before its scheduled Sept. 2nd premiere. "We're not hiding anything," said CW, "simply keeping a lid on 90210 until 9.02, riding the curiosity and anticipation into premiere night, and letting all our constituents see it at the same time." Translated, they're hiding something while also poisoning the pond. Call 911 for 90210. ***CBS has signed a pretty big fish, Laurence Fishburne, to join CSI: Crime Scene Investigation at about the time that William Petersen and his quirky Gil Grissom character will be saying goodbye. Petersen is scheduled to leave CSI after the upcoming season's 10th episode, although he could return on occasion as a guest star. Fishburne will make his first appearance on the show's ninth episode, playing what CBS describes as a "former pathologist who is now working as an itinerant college lecturer teaching a course in criminalistics." Fishburne's character doesn't have a name yet, but "his focus is on understanding criminal behavior, how and why people commit acts of violence -- tendencies he disturbingly sees within himself." Therefore he's perfectly suited to become a new team member. Or something like that. CSI will launch its ninth season on Oct. 9th under current scheduling plans. It's still CBS' most popular show, ranking ninth last season with an average of 16 million viewers per episode. ***CBS has no current plans to turn this into a special, but most of the major cast members of Dallas will be gathering anew at Southfork Ranch to commemorate the long, tall serial soap's 30th anniversary. The big night is November 8th, with Larry Hagman, Linda Gray and Patrick Duffy among the announced attendees. Tickets are high-priced, ranging from $100 to $1,000 per person. This will require your onetime "Who Shot J.R?" chronicler to wrangle a complimentary press pass. Or maybe bus tables? Dallas premiered on April 2, 1978 and ran all the way until May 3, 1991 as a weekly series. Several made-for-TV movies and an earlier televised reunion have hit prime-time since then. The Nov. 21, 1980 "Who Shot J.R.?" episode remains the second highest-rated TV attraction of all time, behind only the Feb. 28, 1983 finale of M*A*S*H.
***TNT's 50th episode of The Closer, on Monday, Aug. 25th, will be directed by star Kyra Sedgwick's husband, Kevin Bacon. Following on that same night, the network's Saving Grace has its "summer finale."